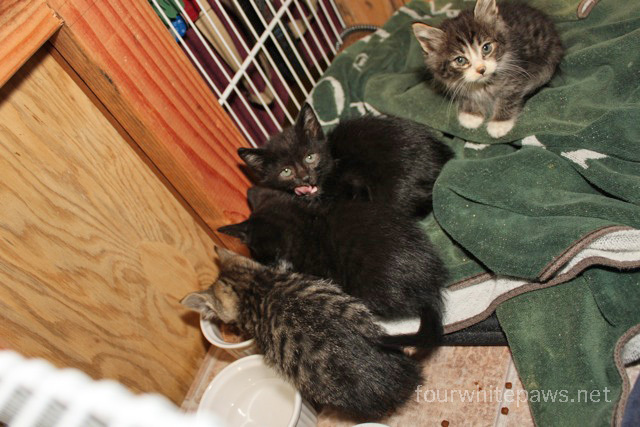 Six teeny tiny feral kittens! They were trapped by a colleague on Wednesday at a TNR site we are working on. 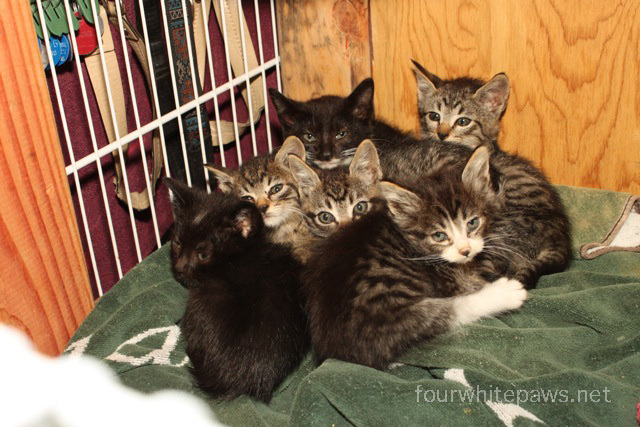 She went to assess the site and found these six kittens shivering in a pile. 15 minutes later she had three in each trap! We believe them to be 10 weeks old (dating from which teeth are in). We suspect they are undersized due to coccidia, a nasty intestinal parasite. Once that nasty bug is gone they should start growing like weeds! 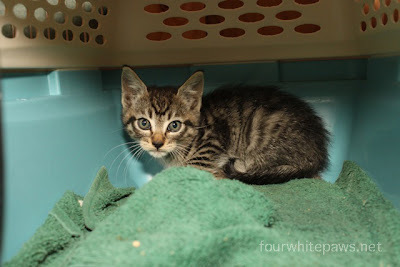 The kittens are all staying in the feral cat holding pen I built as part of my TNR Operations Center in the garage. They LOVE the heating pad! This little girl has goobers in her eyes, something we are treating as well. There are four girls and two boys - three brown tabbies, one black and gray tabby, a solid black, and a black and white. Most of them are just over a pound and two are around 11 ounces. Tiny! They are all little darlings. I hope that you can get their nasty parasites all cleared up quickly. Socializing them should be both fun and maybe a tiny bit frustrating, as they can go back and forth between hissing and not hissing. These guys are so incredibly cute! They have no idea how lucky they are. Thank you for doing this wonderfully compassionate work! They are so cute...bless their little hearts AND yours for rescuing them. Hopefully they'll be healthy and adopted in no time. Oh I am just overwhelmed with the adorableness. What a challange but how rewarding it has to be. Precious little pnes. So pretty and so innocent. Thank you so much for taking them in and helping. they are just toooooooooooooooo precious!!! One thing I know that works well is hand feeding them either with a spoon or right on your finger. YAY! I bet they turn in no time at all. LOVE your holding pen! 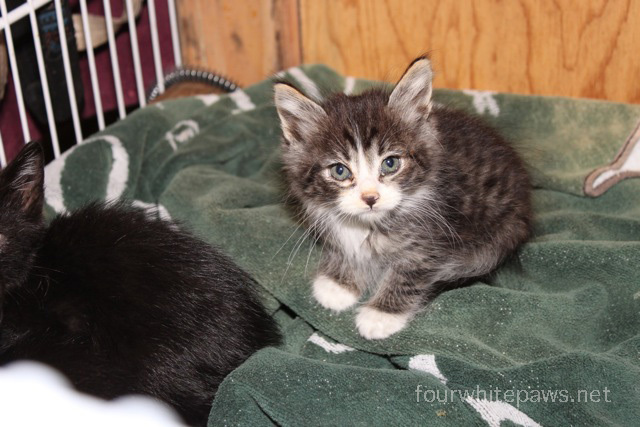 How cute, so glad they were found and area getting such good care by a cat lover! Oh my what a great housing unit you built for your kitten taming! That is like a 5 star resort, especially after what these guys have been through. Those faces are simply so sweet and it breaks our hearts to think of this countless scene over and over and over again with no help for so many homeless cats. We are thankful that there is so much help out there and we are glad these 5 will see a huge break for their lives. nice save....what a bunch of cuties. 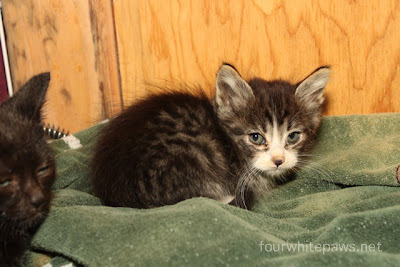 Alley Cat Allies has some info on taming feral kittens as well. I read that you can use the help of an older calm neutered male cat. Sure...right I said. Until Tim got recruited as my assistant. You may be able to find an assistant of your own. Good luck and don't be afraid to ask questions! Wow, you are really diving in there. 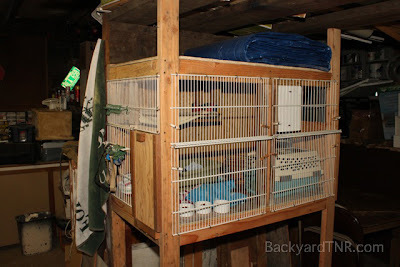 That's a wonderful feral kitten hotel you have for them. Bless you for doing this. What little sweeties!! I'm so glad someone found them and that you are taking care of them. Hopefully they will all be on the road to recovery soon. Cute cute cute!